Pamela Pitcher Confidence & Clarity Coach | Pride or Pain? Pamela Pitcher Confidence & Clarity Coach / Confidence / Pride or Pain? It’s been raining hard. I have mud all up my calves, my hiking shoes are filthy, my feet ache, my big toe nail on my left foot has turned purple and I have blood blisters at it’s base, I’ve developed blisters on my right foot and hand, I walked 25 km today. I am on the Camino de Santiago de Compostela in Spain and I’m about to take a glorious hot bath – after I shower down my legs of course. Who wants a muddy bath?! For those of you who do not know, the Camino de Santiago or Way of St. James, is the pilgrimage to the Cathedral of Santiago de Compostela in Galicia in NW Spain, where legend has it that the remains of the apostle, Saint James the Great, are buried. It is difficult to define where exactly the Camino starts as pilgrims used to start their journey from home, but over the years, different ‘ways’ have emerged. The French Way is the most popular and it usually starts in the French Pyrenees. There is also the Northern Way, the Original Way, the Portuguese Way and the Finisterre Way. We met someone who began his pilgrimage from Geneva. One of my compadres (friends) tells me that when it comes to discussing physical challenges, that one can discuss the pain or the pride. 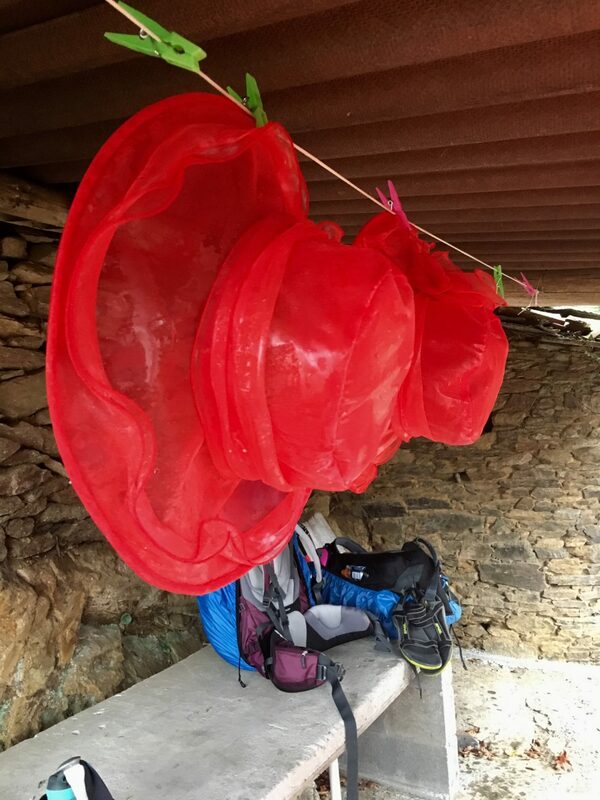 Today is the third time he attracted bed bugs, which is very common on the Camino. Despite this and the other hardships he has endured walking over 700 km, he says he will only discuss the pride of his adventure. I am obviously not of the same mind. My compadres began their Camino adventure in St. Jean Pied de Port, France. They chose to walk the Way of St. James. One of them is my oldest friend, who I have known since I was 5 years old. She has been the sister I never had and we’ve been there for each other through life’s ups and downs since we were little girls. For confidentiality sake, you may know her as Louise. I had toyed joining Louise, her husband and other friends on the Camino throughout 2017 but decided not to join them because I didn’t’ think I was ready for such a rigorous pilgrimage. In 2010, I had reconstructive foot surgery on my right foot. A year later, I had two surgeries on my left foot. Then I suffered a blown out knee on the slopes of Klosters which was nothing compared to the ski accident of 2015 on the slopes of Whistler where I shattered my pelvis in a number of places and tore the tendons and ligaments of my right thigh to shreds. No body goes through such a long rigmarole without having a number of physical knock-on effects. My rehab continues to this day. Then something happened. Days before Louise was due to leave home and travel to start the Camino her mother, Doris passed away suddenly. After speaking with friends and family, it was clear that Doris would have wanted her to complete her pilgrimage and so her service was arranged for a later date. Doris was my second mom. She helped me through some of the most challenging times of my life and news of her passing was a deeply sad moment for me. I was consoled by the fact that she had lived a good, long life and that she didn’t suffer in the end. Her body simply wore out. I had a decision to make. Should I join Louise in Spain or attend the service in Vancouver? It wasn’t a difficult decision, I knew I wanted to support her the best way I could so I booked my travel to join her and her tribe for the last leg of the Camino from the town of Sarria. Surely 5 days of walking was do-able. After all, I hike a lot. I would have liked to join them sooner but I already had other travel plans that couldn’t be changed. In hindsight this was a blessing because walking the last 120 km from Sarria to Santiago was all this body could handle. And I didn’t even realize that until I arrived home. Two things were in the forefront of my mind as I planned my trip. First, was to support Louise and I would do that by spending 5 days and 6 nights with her, sharing stories of her mom and supplying hugs and whatever words I could think of to console her. Second, I wanted to honour Doris and her life, but how? Then it came to me like a flash – red hats! I ordered 3 red hats so the female peregrinos (pilgrims) of the tribe could wear them on the Camino. The costume for women of the Society is to don red hats of course and to wear purple. The Red Hat Society have adopted the poem by Jenny Joseph entitled ‘When I Am An Old Woman I Shall Wear Purple.’ Ever the rebel, I adore the first paragraph and I hope you will too! We wore our red hats proudly along the Camino for Doris. We were quite a hit. Other peregrinos from as far away as Brazil asked to be photographed with us and we could see people sneaking videos. Doris would have loved that. It’s now 3 weeks since I bid farewell to my friends in Santiago in more pain than I was letting on. And unfortunately, the pain changed and worsened days after my return. Because my feet don’t splay correctly when they hit the ground the high ankle ligaments pulled away from the bone of my left ankle. It felt like my calf bone was breaking in two. And because I have so much scar tissue in my right thigh, my rectus femoris tendon was pulled tightly on the inside of my right knee when I walked. Now that area is swollen and tender. Both areas gave me excruciating pain for about 10 days. Thankfully, all is easing and I am getting back to normal although I won’t be walking any distances soon. Experiencing pain is one of the most noticeable differences between going on a pilgrimage and going on a vacation. And although I was a peregrino of only 5 days, I witnessed the profound pain of a daughter losing her mother, made my peace with Doris’ passing, and physically I suffered like a good pilgrim should. I wouldn’t have had it any other way because it was invigorating and fun too. Along the Way, my friend told me a story about what happened to her early on the Way. She found a necklace with a pendant in the shape of a cross and in the middle of the cross was a heart. She asked everyone she came into contact with if they had lost it. Nobody had, so she began to wear it in hopes someone would recognize it and claim it. Nobody did. Then she came across a statue of sorts where other pilgrims had placed items. She decided to take off the necklace and hang it on the statue. She said, “It was never mine. It never belonged to me. I was fortunate enough to wear it for a while.” Tears rolled down her face. I was grateful to share such a poignant moment with her. They say that everyone has their own Camino. Through pain and with immense pride, I am happy to say that it is a cherished chapter of my life.